Mike has decided to get out of the military. Perhaps I should say that we have decided to exit the military, though Mike is the only one changing jobs. But when one person is in the military, really the whole family is. He received the orders, but we all moved because of them. He wore the digital camouflage, but I washed it every week. He deployed, but I lived with the cavernous space of his absence. I worried about him and missed him and wept every time I stood for the national anthem. He got haircuts every Sunday, but we went with him after church, dressed in nice clothes and starving for lunch. Molly now expects a lollipop after church, because Mike’s barber always gave her one. Speaking of Molly, she has spent her toddler years in the most ideal neighborhood imaginable, full of military kids that have grandparents that live in other states. Some of her pals see a helicopter in the sky and call it a “daddycopter,” because their daddies fly them. One little guy marches rather than walks, carrying a stick in his belt loop like a sword after watching his dad lead Marines in perfect cadence. It was Mike’s job. But it was our whole life, too. And if I’m honest with you, leaving the military feels weird. It feels really weird. On the good days, we called this change “adventure.” On the bad ones, we called it ‘disruption.’ We have loved far more than we have hated about the Marine Corps, though we have often held both emotions at the same time. Some might say leaving the military is leaving behind a life of change. But getting out of the it is confronting a sort of change that’s totally foreign to us—- the steadiness of stability. For the first time in a decade, we are moving somewhere we choose, rather than a place we were told to go. Mike is going to select a job. He will apply and interview. We are going to choose a house that we will live in for longer than a year or two. We are going to curate a quality of life that no one else is responsible for. It’s up to us now. And this excites us. But it also scares the hell out of us. Mike is leaving the military by choice, on his own terms, when his job satisfaction is at its peak, when he has fresh orders in hand that would have been a great opportunity. He is choosing to leave when there was a spectacularly bright future ahead of him in the Marine Corps, which is another way of saying that he is choosing to leave at the moment it is most difficult to. If this conversation were face-to-face, I would rush right into the logistics as we know them. I would tell you about our plans to move back to Colorado. And although I’m sure you would celebrate the decision with us (you are the encouraging sort, I presume), I would also feel the overwhelming urge to defend it to you. To make a compelling case as to why the retirement package wasn’t enough to keep us in for the full twenty years. To tell you about how wonderful our family is, how much we want to live near them before our children or our parents grow too old. If you were familiar with the military, I might mention some organizational frustrations Mike experienced, which is a normal part of working anywhere for nine years. You’re privy to the bad as much as the good. 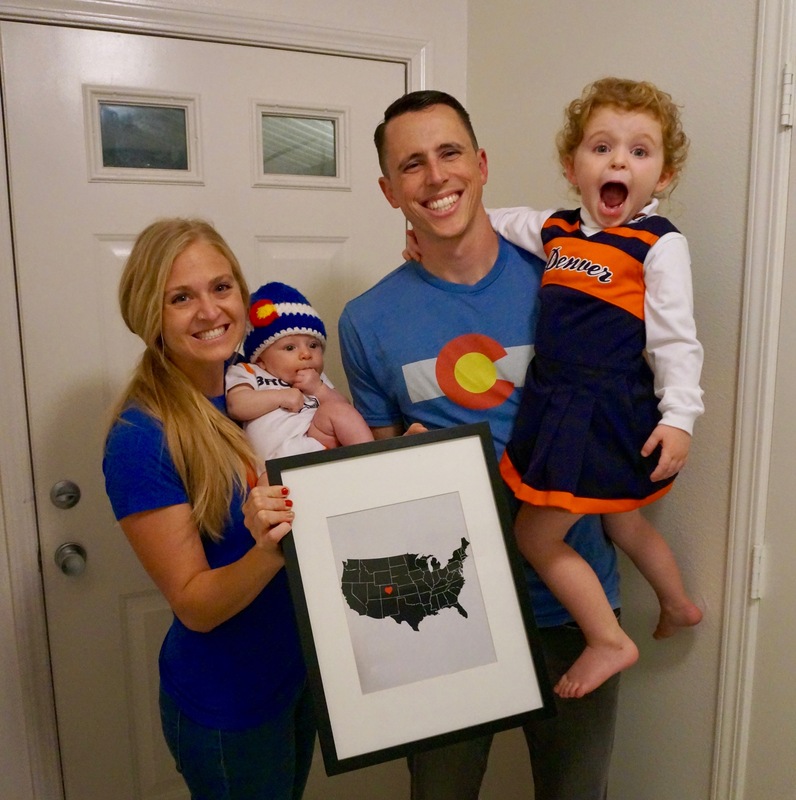 I would likely spend a great deal of time trying to tell you how much Colorado means to Mike and me. I would say that it’s not just a pipe dream for us. Colorado is our home. It always has been. And if we were face-to-face, you would hear my voice fall into a whisper, you might even hear the lump catch in the back of my throat as I confessed to you that the thought of raising our kids away from that home was a devastating one for me. I would have borne it. But it would have been hard. We are having this conversation screen-to-screen, yet still I feel the need to overexplain because, honestly, the decision could have gone either way. If a dozen contingencies had become actualities, then Mike would have stayed in the military. The competing futures of staying in or getting out was not resolved in a blowout victory here. It was long, tedious struggle that used up all of the overtimes and all of the timeouts. For over a year we have been deliberating, praying about it, seeking counsel. And what we largely heard from God was the constant promise that he was with us. There was no cosmic moment, no writing in the sky, just the hope that God was a good Father that never abandons his children. Either way, in every outcome, he was with us—redeeming and working all things for good. Sometimes making a decision is not as simple as choosing a good option over an alternative that’s bad. Rather, it’s choosing between two goods, two options that are equally radiant with glowing potential. Inversely, that also means you’re choosing between two profound sacrifices and asking which one you can bear to make. If Mike had stayed in, the sacrifice would have been of living near family and raising our kids around the people we want as the primary influencers in their lives. Our kids would have gone to a collection of schools, lived in a series of houses, and gained the benefits of resilience through the hardship of transience. There would have been the loss of a civilian career that may or may not have been better, but in any case, it’s one that wouldn’t include deployments. To put it another way, we would have sacrificed a sense of agency over the next decade or more of our lives. But now that Mike is getting out of the military, the loss is of a community we love, a subculture in which we belong. We are losing the adventure of moving often and the inherent pride of serving our country. But it’s not even the pride of patriotism that I will miss most. It’s the pride in choosing the harder road. It’s the pride of resilience, really. Everyone keeps asking if we are excited, and of course we are. But there is the making of the right decision, and then there is also the untangling from the option you didn’t choose. There is excitement for what you are gaining, but also a sense of loss for what you’re leaving behind. Because you never realize how much something is part of your identity until it’s time to let it go. And in this case, taking an giant leap of faith also feels like the floor is falling out from beneath you. My sister called the other day to tell me she bought bunk beds so that our daughters could have sleepovers together. And I cried tears of excitement, tears of relief. Then I saw Mike’s combat boots in our entryway the other day, his dog tags stashed inside. And I cried imagining him wearing other shoes to work, ones that don’t emit a characteristic sense of toughness and bravery. They’re just shoes, I know. But they’re not just shoes. They’re symbols. So if you see Mike or me, tell us congratulations. Yes, we will celebrate with champagne! With jubilation! But then give us a big hug. Because in this enormous leap we are feeling expectant and sure, but our feet are also peddling in the absence of familiar ground. I know, I know, what a thrill it is to fly. What a dream come true to move home to Colorado. But is it not also the scariest thing you have ever done? Thank you to you, Mike and your family for your service. God bless you in your journey. Wow! You took the words right out of my mouth! We are going through the same change right now and can honestly say every word you wrote, I am experiencing at this very moment as well. I have to say it is so refreshing to hear someone else is going through the same experience and is committed to seeing the light in the situation as the transition has its challenges. Im sending you a hug and a huge congratulations! Look forward to following your journey as it unfolds. Find me on instagram @thefitmamaspantry, I will be sure to find you as well! Congrats Difelice family! Blessings for the new phase.